Hi friends! I'm back with a new 1-2-3 card design for you for March! Thank you for leaving your comments last month - it's so much fun to hear from you, and I'm glad you are enjoying the designs. These 1-2-3 Cards can be made quickly and easily with 1 Sentiment, 2 Paper Shapes and 3 Embellishments. Easy, fast and fun! 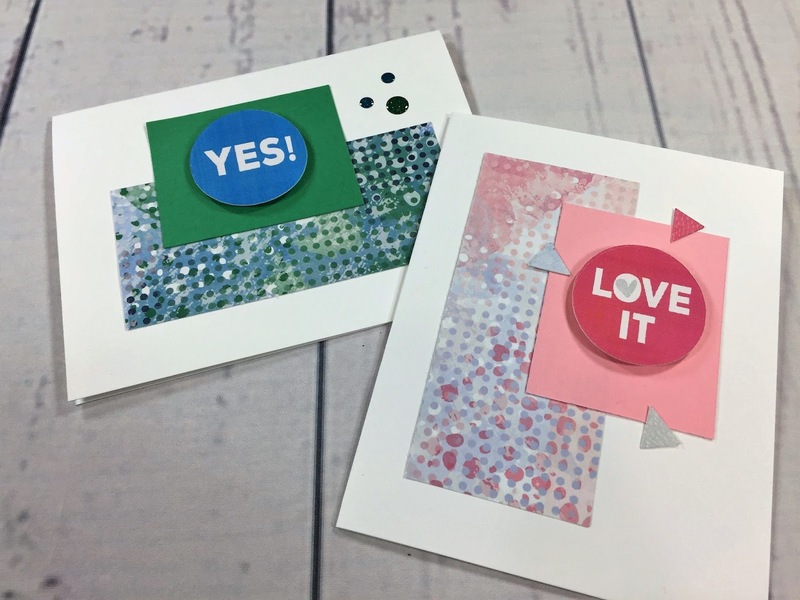 This month I'm using up leftovers from Creative Memories' Sorbet Collection, but you can change the look of these cards for any occasion simply by changing up the paper and coordinating embellishments. Each month I also make a short video showing you how to put the cards together AND offer you a chance to WIN a card kit! All you have to do to win is leave a comment at the end of the blog post or under the video on my YouTube Channel or both! At the end of each month I'll draw a random name from all the comments on both sites and send the lucky winner a kit to create both the cards that were featured that month! What occasion do you think you might use this card design for? I'd LOVE to see what you type of card make using the sketches - besides commenting for your chance to win, please share a pic of your cards on my Facebook group to show us how YOU used the sketch! Don't forget to click here to download your copy of the handout with the sketch and dimensions so you can make your own, and leave a comment here and/or under the video on my YouTube Channel to be entered for a chance to win! Congratulations SANDY BERGHUIS!!! Sandy, please send me your mailing address via email at organizedandcreativemom@gmail.com and I'll get your happy little card kit in the mail to you asap! April 1-2-3 Cards will be up on Monday April 10! Love the cards! Great ideal to use you left over pieces too! Love these cards! Great way to use your left over pieces! So glad to learn about your 1-2-3 cards! So quick and easy especially when you need a card now! Thanks for introducing me to this great method! Where did you purchase your self healing cutting mat and what size is it? Where did you purchase your self-healing cutting mat? And what size is it? Thank you.